The Camino restaurant group's brand of authentic Spanish cuisine is delicious for many reasons – one of them being the influence of executive chef Nacho del Campo. He's been at the helm of Camino's four sites in King's Cross, Monument, Bankside and Blackfriars for several years, taking his inspiration from him Basque country roots. Here, he shares his recipe for goat's curd mousse with pomegranate, walnuts and honeycomb. Whisk the cream with the sugar and the vanilla seeds until the mixture begins to firm. Soak the gelatine leaves in cold water for a few minutes to soften, then melt in a saucepan over a gentle heat. Add the melted gelatine to the cream mixture, and then gently whisk again to mix in. Carefully fold the goats curd into the mixture with a spatula. To make the honeycomb, stir the sugar with the honey in a pan. Once mixed, place the pan over a low medium until the sugar is dissolved and the mixture is golden brown and bubbling (this will take 3 minutes or so). Remove from the heat and whisk in the bicarbonate of soda to the melted sugar caramel. The mixture will foam and rise quickly, pour this immediately into a deep baking tin lined with baking paper and let it cool. Once set, bash into pieces. 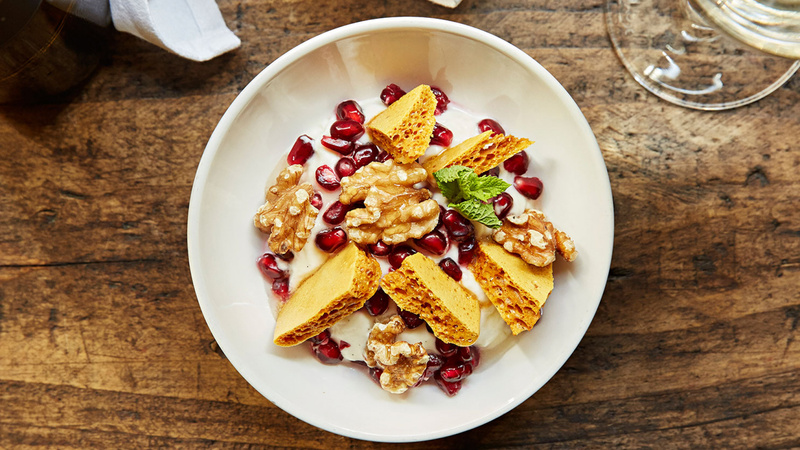 Pour your mousse into individual bowls and garnish with shards of honeycomb, pomegranate seeds and the walnuts. Add a drizzle of the orange blossom honey to finish.